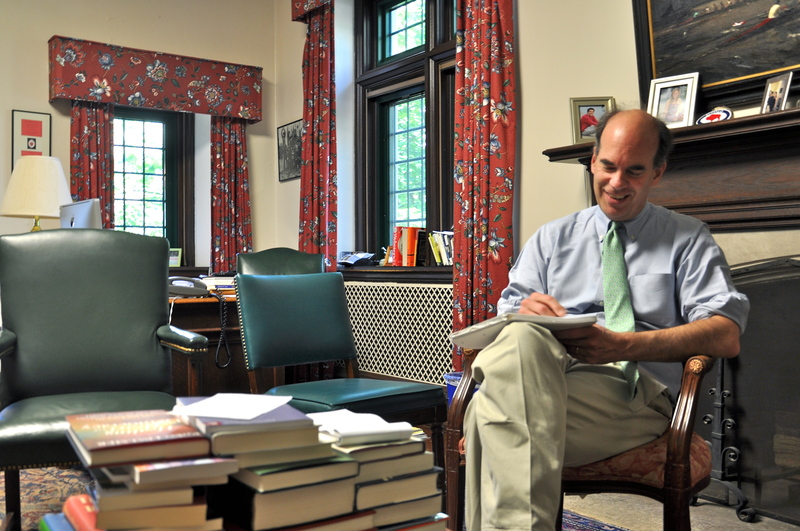 Over the course of the summer, I thought about my first 15 years as St. Andrew’s Headmaster and decided I would share a few of the insights I have made from my experience living in this great community. My teachers and mentors have been my incredible students, colleagues on the faculty and staff, trustees, alumni and friends. Together they have taught me that great education is the product of intentional and generous commitment to certain basic principles. At some point, I would like to take these insights and turn them into a book. I have learned that it is possible to create a school of hope and transformation by rejecting the strategic, distracted culture of the 21st century. I have learned that education at its best is a coherent and compelling response to the needs and concerns of our nation and world. I have learned that education can teach and inspire students to be independent, creative, autonomous learners and engaged citizens. I have learned that schools do not have to sacrifice mission, values and ethics in pursuit of success—no matter what the world tells them. I have learned that parents will embrace the audacious purpose and art of education even in a strategic age. I have learned that it is powerful and affirming to invite and challenge students to join adults in the creation of school culture and the development of school programs and initiatives. I have learned that it is possible to create a culture in which adults respect and celebrate the human dignity of students. I have learned that students are eager to reject alcohol/drugs, cheating and violations of the human spirit. I have learned that adult culture is the precondition for a vibrant, vital and healthy school and adolescent culture. I have learned that adults need to learn how to be adults when they work in schools. I have learned that it is within this faculty’s power to support one another with generosity, skill and commitment when colleagues face tragedy, illness or difficulty. I have learned that one of the most important expectations I have for the work of the faculty is our success in helping to inspire the growth, flourishing and transformation of our colleagues. I have learned that to embrace our mission, we as teachers have to see our work as a calling, not as a job. I have learned that adults need to commit themselves every day to learning—learning from colleagues, from students, from parents, from professionals at other schools. I have learned that the 21st century American private school must commit once and for all to embracing a public good, to diversity, to financial aid and a rejection of privilege, elitism, exclusivity and arrogance. I have learned that great teachers never ask their students to be compliant. I have learned that great teachers excel in the art of empathy for through the cultivation of this virtue they are open to an appreciation of the radically different experience of others in the world. I have learned that we distort the meaning of education when teachers make students emotionally dependent on them, or if teachers allow themselves to solve our emotional issues through our relationships with students. I have learned to understand that the virtue of work arises from our collective appreciation of the gifts of others, from our commitment to rigorous, professional standards, and from habits of acceptability, punctuality and resilience. They teach to cultivate student understanding, creativity and passion. They give students multiple opportunities to exhibit mastery. They use assessments that honor the most important intellectual skills of critical thinking and analysis. They provide prompt, efficient, perceptive feedback on student work. They bring a deep commitment to teaching classes that provide and promote learning and true understanding. They never give up on students. They never gossip or complain or ridicule a student. They express a deep belief in each individual’s ability to learn. I have learned that an Episcopal School must strive not only to hold Chapel services but to live with the spirit of generosity, empathy, love and forgiveness explicit in this religion. I have learned that a school’s legacy can be the cultivation of a new, ambitious generation of classroom teachers serving public and private schools in America. I have learned that the school and its resources strain each year to support us, make it possible for us to live on this campus, educate our kids, provide professional development opportunities and benefits. I have learned that such resources are finite and we must be careful to preserve the school of the future as we celebrate the school of the present. I have learned that the test of a great community is how we honor and celebrate children. I have learned that the child sexual abuse crisis is a literal and metaphorical portrait of adult depravity and indifference to the innocence, fragility and beauty of youth. I believe this crisis can awaken us to the emotional, physical, psychological damage teachers can do to young people. I believe we all are responsible for ritual within the school. I have learned that ritual provides the foundation for our culture. I believe that we as adults should do community service along side our students. I believe we should stop worrying about the mistakes and limitations of others and work on ourselves. I have learned that with effort, attention, courage and intent, we can be better people than we normally are. I have learned that email sent after 1 a.m. is probably email that should not be sent. I have learned that St. Andrew’s is a grand experiment in education.